A number of municipalities in the Czech Republic are situated in areas with a significant flood risk. Municipalities in the foothills and mountain areas are especially affected by flash floods. Every year there are 60–100 flash floods in the Czech Republic, some of them with disastrous consequences. They occur exclusively during the summer, usually when low pressure systems are followed by cold fronts and precipitation of high intensity, typically more than 30 mm/hour, can be encountered. Flash floods cause sudden surface and subsurface runoff, sometimes accompanied by soil water leaching. In some cases, flash floods can be predicted from the synoptic situation, but it is impossible to predict the exact time and place of these events. Therefore the rain forecast has a lead time of only tens of minutes before the flood. Such a short time does not allow enough time to save residential and industrial buildings but is usually sufficient for the rapid evacuation of people from the affected area. This is significantly different from the floods which are caused by regional rain. In this case, the rain forecast is quite reliable in terms of time and place. It has a lead time of two to four days, which is sufficient to implement large-scale protective measures (construction of flood walls, etc.) and proper evacuation of people. Efforts to achieve greater lead times for storm flood prediction have led to the analysis of lightning during storms. This should achieve three hours or shorter prediction of the origination of dangerous rain storms. There are a few studies around the world aimed at better predictions of flash floods but at the same it is known that a detailed localization of torrent rain is in fact unpredictable due to the essential atmosphere instability. It can therefore be concluded that worldwide research activities are mainly focused on prolonging the lead time of rain storm forecasts. At the Institute of Hydrodynamics the system was developed for the detection of four key factors determining the flash flood origination. The pilot local warning system for flash floods was created in the headwater region in the Giant Mts. Project of the local warning system for flash floods solves the improving of the prediction of flash floods origination taking into account the newest findings about hydrodynamics mechanisms of runoff formation from a small basin. Long-term hydrological research conducted by the Institute of Hydrodynamics proved that the flash flood origination is influenced significantly, besides by intensive precipitation, by the further risk factors. It was find out that extreme outflows are caused by these factors and theirs combination: (1) water oversaturation of the soil surface, (2) water repellency (hydrophobia) of the soil surface (3) gravitationally destabilized flow of water in the soil, (4) extreme torrents usually after the long drought period. Typical combination causing the extreme outflow are: (1) and (3) – gravitationally destabilized flow can be developed by a small rain events during the oversaturation of the soil surface, (2) a (4) – a long-term drought period can cause of water repellency of the soil surface and simultaneously causes a rise of meteorological situation with extreme precipitation. The present method of early warning is based, besides on the measurements of rain intensity, ran totals and discharges, further on the detection of the individual risk factors: (1) the air and soil temperatures are measured – the long-term high temperatures indicate a high risk of the soil hydrophobia, (2) the tensiometric pressures in the soil are measured – the low absolute pressure values indicate that water in the soil is not tightly fixed by the capillary forces and the infiltration of water even from a small rain can develop gravitationally destabilized flow, (3) air temperature and global radiation is measured and the production of entrophy during the evaporation is calculated – a high cumulative deficit of the production of entrophy indicates a risk of forming of meteorological situations with local torrents or frontal disturbances with extensive rains. The project involves the instrumental, software, dispatching and methodological unit of sophisticated local warning systems for flash floods. Several crucial factors contribute to runoff formation: rainfall intensity and its total, water retention in a catchment, and hydrophysical properties of soil and subsoil including water retention in the soil cover. A key issue in the research of runoff is the evaluation of the share of each of these processes affecting runoff formation. It was found that water retention in the soil and the entire basin significantly influences runoff formation. The crucial role of soil water in the runoff formation is well known because soil cover creates large water reservoirs in the Czech Republic, the retention capacity of the soil cover is one order higher than the volume of all artificial and natural water reservoirs. Typical water retention capacity of the soil cover ranges from 60 to 90 mm in the mountainous and submontane basins. Water retention and runoff formation have been studied in several experimental basins in the Czech Republic, especially in Bohemian Forest and Giant Mts. The anomalous phenomena in soil water flow were observed: in some situations, the water supplied by rain caused a pronounced decrease in the soil water and in these periods, the soil water movement could be explained only by assuming an irregularly oscillating outflow of soil water into lower horizons. When the soil moisture content exceeds a certain threshold value, gravity-driven flow of the soil water arises. In such a situation, a large volume of water starts to flow through the soil into the bedrock (spill phase). When the soil moisture content drops below the threshold value, gravity-driven flow vanishes and it is replaced by diffusion flow, during which water moves slowly from the soil into the bedrock (fill phase). Therefore, the fill-spill effect can be formulated as follows: There is a threshold value of the soil moisture content. If the soil moisture content is smaller than the threshold value, water is filling soil pores (fill phase) without leaking into the underlying bedrock. If the soil moisture content is greater, water is released from the soil (spill phase). During the fill-spill effect, a large volume of water flows through the soil into the bedrock. Therefore, at the basin scale, this phenomenon creates some part of the runoff. 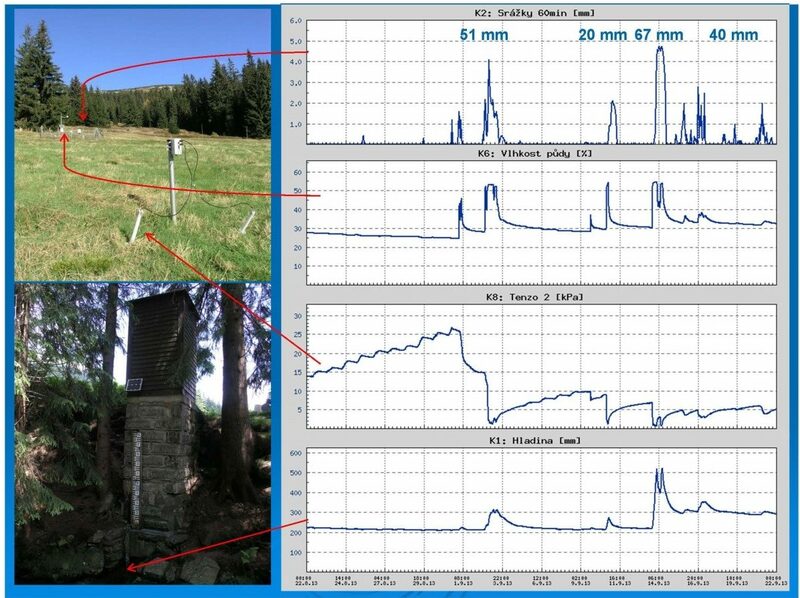 The anomalous water flow in the soil profile (the fill-spill effect), that was experimentally proved in the mountainous regions of the Czech Republic, can influence (reduce) retention capacity of rain water in a basin and increase outflow velocity. This play an important role for flash floods prediction. The detailed monitoring of these processes forms a basin of the early warning system (EWS) building. The sophisticated EWS for flash flood detection built in the upper part of the Úpa River basin in the Giant Mts. (closing profile at Horním Maršově, 568 – 1602 m. a.s.l., 100 km2) is based on knowledge of runoff generation gained through long-term experimental research in small catchments in the Giant Mts and the Bohemian Forest. A prediction of the flash flood risk is solved by a software parts of EWS that uses as input hydrological and hydrometeorological data measured in the framework of the catchment (water level in a brook, discharge, rain intensity and total, tensiometric pressure of soil water, soil and air temperatures). As an input of EWS software using of a robust forecasting scheme is creating and sending of the warning messages to an unlimited number of phones and email addresses. The described EWS is under the operating under the long run by the Horní Maršov municipality. Šír, M., Tesař, M., (2013). Water retention and runoff formation in the Krkonoše Mts. The Supplementum of Opera Corcontica. 50, 97–106. Tesař, M., Šír, M., (2013). 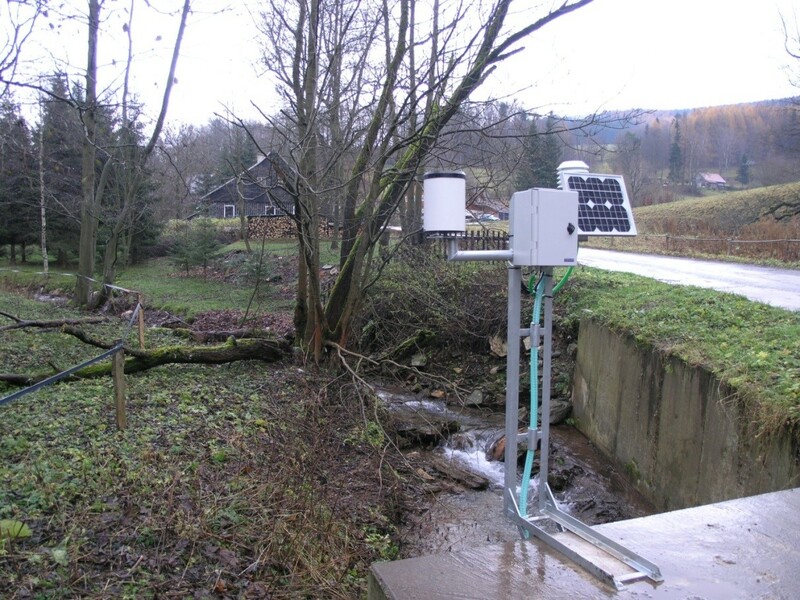 Early warning system for flash floods in the Krkonoše Mts. The Supplementum of Opera Corcontica. 50, 107–112. Tesař, M., Šír, M., Lichner, Ľ., Fišák, J., (2008). Extreme runoff formation in the Krkonoše Mts. in August 2002. Soil & Water Research. 5 (Special Issue 1), 147–154. Tesař, M., Šír, M., Pražák, J., Lichner, Ľ., (2004). Instability driven flow and runoff formation in a small catchment. Geologica Acta. 2(1), 147–156.